I don’t know about you but mascara is one of my favorite makeup products. It’s definitely a lifesaver when I don’t have time to do my full makeup. Besides, it’s the only product that I would never leave my home without. And it’s always worth spending extra bucks on a quality mascara, especially if you have sensitive eyes like me. Some mascaras may cause irritation. However, if you’re not sure that you’re sensitive to some makeup products, there are signs that show if you are. For example, if your eyes or eyelids get dry, red, watery, flaky (I will explain all the symptoms later in this article, so make sure you stay with me until the end), you might be experiencing an allergic reaction. And your mascara might be the main reason. If you suspect that your mascara is causing you problems, consult your doctor immediately and stop wearing eye makeup for a while. Once the symptoms disappear, I suggest that you replace your current mascara with some of the best mascaras for sensitive eyes. According to makeup experts and cosmetologists, you should replace your mascara every 3 months. 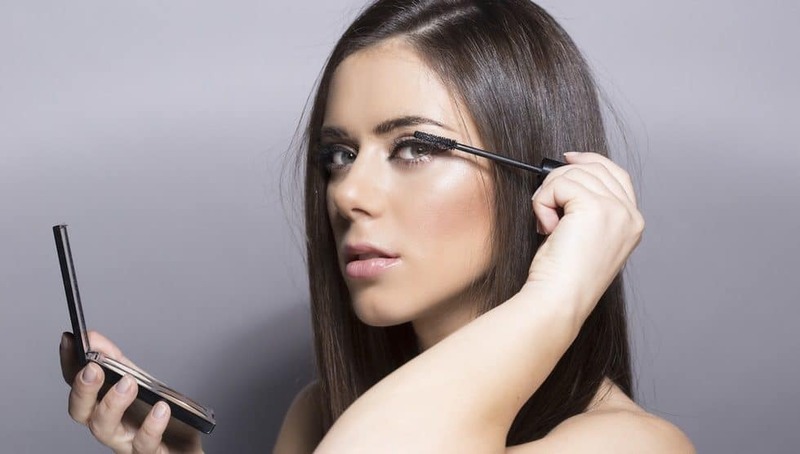 If you’ve been having your mascara for too long and you’ve been experiencing some allergic reactions, use this as a healthy excuse to purchase a brand new hypoallergenic one. What to do if I’m having an allergic reaction to eye makeup? How to apply mascara when you have sensitive eyes? If you’re currently searching for the perfect match, make sure that you experiment with different mascaras. However, never purchase a product that’s popular just because of the brand. Check the label and search for the term “hypoallergenic” if you have sensitive eyes. Also, search for the term “organic” and “natural”. Make sure that the product isn’t made with harmful ingredients like petroleum, parabens, dye, artificial fragrances, and others. Also, I recommend that you go simple when searching for a hypoallergenic mascara. Fiber mascaras are quite popular because they lift the lashes like no other mascaras. If you buy this type of mascara, the fibers might fall into your eyes and cause an allergic reaction. So, instead of focusing on achieving that “falsy” dramatic look, focus on the ingredients on the back. What if you purchase a popular brand when you can’t use it because it causes an allergic reaction every time you put it on? Look for lengthening and volumizing mascaras. In case you don’t have any clue which products are the most recommended at the moment, I have reviewed the top 10 hypoallergenic mascaras on the market. Check them out! If you want a high-quality hypoallergenic mascara that will protect your eyes and give you that glam look, this is the perfect product for you. La Roche-Posay will smoothen, define and extend your lashes. A black formula with the polymer. Your lashes will look structured and well-separated from the root to the very end thanks to the double-sided brush made to intensify lashes. It’s fragrance-free, paraben-free, allergy and ophthalmologist-tested. You don’t have to worry because it’s specially designed for sensitive eyes. So, if you want visibly longer lashes, it’s recommended that you place the brush at the lash roots. After, slowly move towards the ends to separate the lashed. In the end, apply to the entire lash. No need for the repeated application. One of the best hypoallergenic products currently. Are you searching for all-in-one makeup product that will define, extend, and give volume to your lashes? If yes, I have the best product that will meet your requirements. It’s the Honest Beauty Extreme length mascara. It acts as a primer as well. Meaning, it’s a 2-in-1 primer and mascara. It will create an even base and intensify the color of your lashes. A product that’s been specially designed for sensitive eyes with a rich formula that will lift and extend like no other product on the market. It doesn’t have parabens, petrolatum, sodium lauryl sulfates, paraffin, synthetic fragrances or mineral oil. It’s perfectly safe. For a fuller effect, apply a second layer on center lashes and play with the outer lashes. The name says it all. A natural mineral mascara made with organic ingredients and non-GMO and other harmful ingredients. It’s one of the best hypoallergenic mascaras on the market, specially designed for sensitive eyes. A black formula that provides silky smooth appearance and will take care of your eyes like no other product, especially if you have dry eyes. It has no parabens, toxins, petroleum, dye, gluten and other harmful ingredients. A 100% natural and vegan product that offers buildable volume. A mascara that will make your lashes look thicker, longer and stunning without causing an allergic reaction. You can also use it as a liquid eyeliner. Just dip an older eyeliner brush and apply on your eyelids. If you’re searching for a mascara made with the highest quality ingredients such as oils, minerals, and plant extracts, stop your search right here and right now. I found the best of the best. The Ere Perez Natural Almond Oil will meet your requirements and overtop your expectations. Specially designed for sensitive eyes, this mascara in black provides a highly-effective, gentle, easy and fast makeup solution for your dry or watery eyes. It’ll perfectly extend your lashes and give you that glam look. A water-proof formula, free of parabens, paraffin, propylene glycol and other toxins that can cause an allergic reaction. Ideal for contact lens wearers. A great product that has never been tested on animals. If you decide to buy the Reviva Labs mascara, you will gain a lot of benefits from it. First, it’s an ideal lash builder that will not clump, flake or smudge. It comes with a controllable applicator that’s very easy to use. It has a gentle formula, specially made for contact lens wearers and people with sensitive eyes. It’ll never irritate your eyes. Made in the USA, this mascara is soap-free and pH balanced in order to avoid eye irritation. If you are suffering from sensitive eyes, this is the perfect product for you. Besides providing a stunning eye look, it will take care of your eyes like no other mascara on the market. For a more dramatic look, apply 2 layers. Affordable but high-quality product that you will adore. One of my favorite product on the list is the lifted sweatproof mascara. It’s described as the “push up sports bra” for your lashes. I’ve used this one before and I was satisfied with how it treats my eyes. I’m talking about a vegan, waterproof mascara that will lift up your lashes, instead of causing you irritation while working out, swimming or running. After the most intense workout, your lashes will still look flirty and lifted thanks to the rich formula made with antioxidant vitamin C, Amazonian clay and smoothing emollient waxes to protect, extends and soften your lashes. It contains no harmful ingredients. It’s worth every penny. Neutrogena Healthy Lengths mascara is one of the most popular mascaras on the market. And for all the good reasons. It’s specially designed for sensitive eyes, just like the other products on my list. It contains olive oil and vitamin E that will take excellent care of your lashes and provide 100% noticeable, healthy and thick lashes. It comes with a soft brush. It won’t flake, smudge or clump but will strengthen and extend your lashes from the inside out. According to the many positive reviews, it’ll extend your lashes to twice their length. Clinique high impact mascara is a multi-benefit product that will provide stunning lashes and draw all the attention to your eyes. So, if you want to hide some imperfections on your face, you should always do it with boosting your eyes. And this mascara will help you in the process. It will make your eyes pop like no other mascara on the market. I’m aware that I have claimed the same about almost every mascara on my list. But what can I do when they are all great products? This one especially because it gives that rich, intense color. It lasts longer than other mascaras. It’ll never let you down. A dermatologist-tested product that you will fall in love with at first application. Ideal for creating the illusion of bigger eyes. The Natural Expressionist mascara has the boundary-breaking formula that will help you achieve bigger, bolder and sharper eyes. It extends the lashes instantly and will take good care of your sensitive eyes. Everyone will admire your defined, luxurious lashes thanks to the high tech brush that was specially made to separate even the shortest, hard-to-reach lashes. A little goes a long way with the W3LL PEOPLE. It helps you apply a precise amount with every application. Also, it doesn’t contain any harmful ingredients like paraben, gluten, petroleum, and others. A 100% cruelty-free mascara that I personally use and recommend. How does increasing the thickness and length of your lashes up to 300% sounds? If you’re stunned by the number, you will be even more stunned with this mascara. It really provides a 300% more lash volume. A lengthening mascara, specially designed for sensitive eyes and contact lens wearers. A 3D fiber lash mascara that will win your heart at first application. You don’t need to reapply because it lasts all day and all night long unlike other products on the market. It’s easily removable with facial cleanser and warm water. And it’s waterproof. Made with natural ingredients such as pure green tea microfibers, this product is the best. As I mentioned before, there are certain signs that can reveal if you’re having an allergic reaction to eye makeup. Keep on reading to learn the most common signs and symptoms in order to identify the allergic reaction as fast as you can and stop further complications. I’ve decided to share a few symptoms of allergic reaction to makeup. I will not only focus on allergic reaction to eye makeup. I will also share signs of allergic reactions to different types of makeup products. Read on to learn more about allergic reactions to makeup items. One of the most common symptoms of an allergic reaction to cosmetics is rash. You might experience red bumps or small, high hives. However, if you have makeup on your face, you might not notice the rash at first. 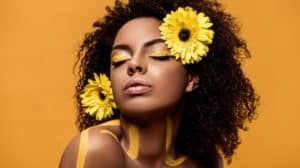 Still, the rash is often accompanied by itching, so this is the first indicator that you’re experiencing an allergic reaction to some makeup products. If you’re having an allergic reaction, it might cause swelling. Sometimes, it’s accompanied by rash and itching. So, if you’re allergic to eye makeup and you notice swelling on eyelids, your reaction might extend to the rest of your faces like your cheeks or eyebrows. It is recommended that you take off the makeup immediately and visit your doctor. Stay away from the eye makeup for a while, at least until the symptoms are gone. After, replace the old mascara, eyeliner or some other makeup product with quality, hypoallergenic product. Also, check the expiration date. According to makeup experts, you should replace mascara every 3 months. However, every makeup products have an expiration date after opening. If eye makeup like mascara and eyeliner came in touch with the surface of your eyes, you might experience an allergic reaction known as ‘allergic conjunctivitis’. Symptoms include a thick discharge, itching, tearing or redness. Also, you can experience sensitivity to light. If you notice some of the symptoms I have mentioned after you applied your face and eye makeup, I suggest that you take off the makeup very carefully. Don’t scrub because it can worsen the irritation. Instead, use a facial cleanser and warm water to remove it. After, I recommend that you visit a doctor and consult about medication to eliminate the reaction and ease your symptoms. After, you must replace your regular makeup with hypoallergenic. If your eyes don’t cooperate with the mascara, follow these steps on how to wear mascara when you have sensitive eyes. Just one mistake and you might cause an allergic reaction, so you should be very careful. However, if you follow these simple steps, you will do just fine. Step 1: If you plan to wear eyeliner, eyeshadow or any other eye makeup, do it before you apply mascara. It will ensure that you don’t ruin your mascara by trying to apply the other makeup. It’s also recommended that you apply full-face makeup before you apply mascara, just like all other makeup experts. However, you can apply blush or foundation at any time. Step 2: If you want defined lashes before you apply mascara, curl then. Place the curler close to the roots of your lashes without touching the skin. Use gentle pressure and curl for about 20 seconds. If you don’t own a curler, you can use your fingertips to achieve the same effect. However, keep in mind that your lashes should be a bit wet when you do this. Step 3: Open the mascara, but not like you usually do. Experts have a way of opening their mascara that you should follow if you want to apply like a pro. Twist back and forth instead of moving up and down. This allows the brush to pick up the product. It also prevents your mascara from getting dry since pumping it up and down allows the air to enter the product. Step 4: Use a tissue to remove the excess mascara. Too much mascara can cause clumping. So, you might want to wipe the brush a little in order to apply the right amount of product. Step 5: Look up to apply the mascara properly. You don’t have to look in the mirror if you don’t want to. However, if you’re afraid of blinking, do what we all do. Open your mouth and start. It’s a proven method against blinking when applying eye makeup, especially mascara. Step 6: Put the brush against the roots of your lashes and move back and forth slowly. If you do this, most of the product will be applied to your roots which will visually extend your lashes. Also, the wiggle will ensure that your lashes stay lifted up for a longer time. Step 7: Make another slight wiggle. Cover the tips of your lashes using zig-zag movement. This move will add extra volume, length, and thickness to your lashes and prevent clumping. Step 8: Apply a second layer of mascara after a few minutes. If you’re aiming for a more dramatic look, apply a third layer. However, I suggest that you stop at the second layer. The more layers, the bigger the chances are that the product will dry on your lashes and cause clumping. If you want the full dramatic appearance, mix a few mascaras designed for different purposes and combine their qualities. For example, a thickening mascara might work perfectly with a lengthening mascara. However, try this out before you go out. If the mascaras don’t cooperate well, at least you will have some time to redo your eye makeup. Step 9: Make sure that you apply mascara on the outer and the inner part of your eyelid. If you apply to the center, it will visually narrow your eyes and they will look a lot smaller. To avoid this, apply the product to the outer, middle and inner lashes as well. If reaching out the inner lashes is challenging, bend the wand to a 45-degree angle. Try again slowly. This will help you apply the product on your inner lashes without messing up your entire face. Some apply to the back side of their lashes because it’s a lot easier. However, you should apply however suits you best. Feel free to explore different application methods. Step 10: Once you have the upper lashes covered, it’s time you play with the lower lashes. First, you might want to use a makeup sponge, a kleenex or a spoon under your eye in order to prevent the product from getting on your skin. Apply mascara only to the base and lift up as you approach the tips. If you apply on the full length of your lashes, it might give you an unnatural look. If you apply too much product, remove it with your fingers. I recommend that you use the tip of the want when applying mascara to your lower eyelashes. If you own a small wand, I suggest that you use it for your lower lashes. Smaller wands are a lot easier to control and apply mascara with. Extra tip: If you own a brown mascara, apply it on your lower eyelashes. It doesn’t matter if you applied black on your upper eyelashes. A brown mascara will add some dimension to your appearance and boost your makeup look. As you have noticed, I reviewed some of the best products on the market for you. And the main reason why I’ve done it is because I know how hard it is to pick the right product for sensitive eyes. I have been there and I can really understand the struggle. I hope you find a matching product on my list. I have to say, I recommend every product I reviewed. I also hope you find the application tips useful and worthy of sharing them with your loved ones.